The City’s Land Clearance for Redevelopment Authority (LCRA) has posted a Request for Proposals (RFP) for a prominent city-owned lot in the Forest Park Southeast neighborhood (The Grove). The full RFP is below, but the city is seeking a 3-12 story building with zero lot line setbacks. The “Urban Design and Redevelopment Requirements” are promising and the community should be able to require good design given the popularity of The Grove. Any proposal should be “a mixed-use, main street character that enhances and densifies the walkable commercial corridor” and it’s clearly stated that proposals “should treat all three adjacent public rights-of-way, including Manchester, Sarah, and Chouteau with equal importance and equivalent sensitivity”. Regardless of the design, if held to the above standards, the form will be urban. What else are they looking for? 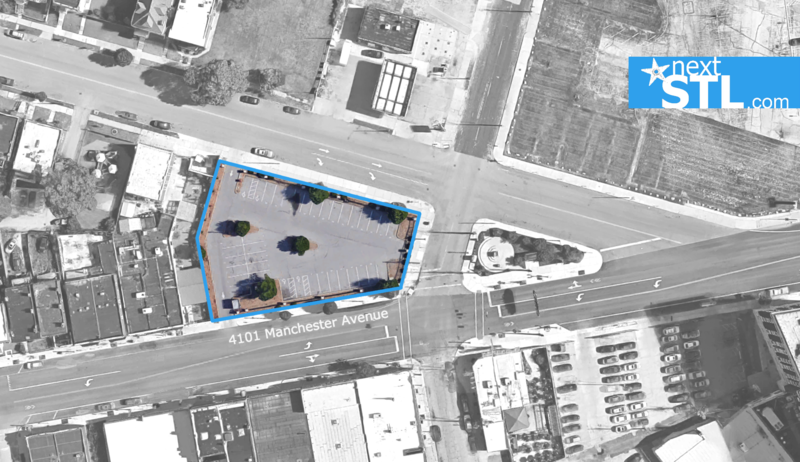 A least 15,000sf of retail space, access to a total of at least 77 parking spaces (to replace the existing 37 and 40 for anticipated retail), either on-site, or nearby, and any parking and loading access from Chouteau only. Though no formal architectural review process exists in the neighborhood, the RFP states that an “emphasis will be placed on proposals that seek to foster…eclectic architecture design”. The RFP is open until September 2. The city’s minimum sale price for the lot is set at $120,000. 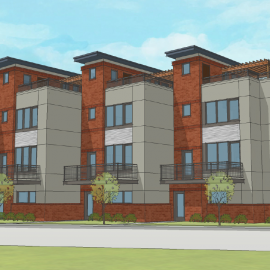 At the end of 2014, Green Street envisioned the lot as part of the Chouteau’s Grove development. 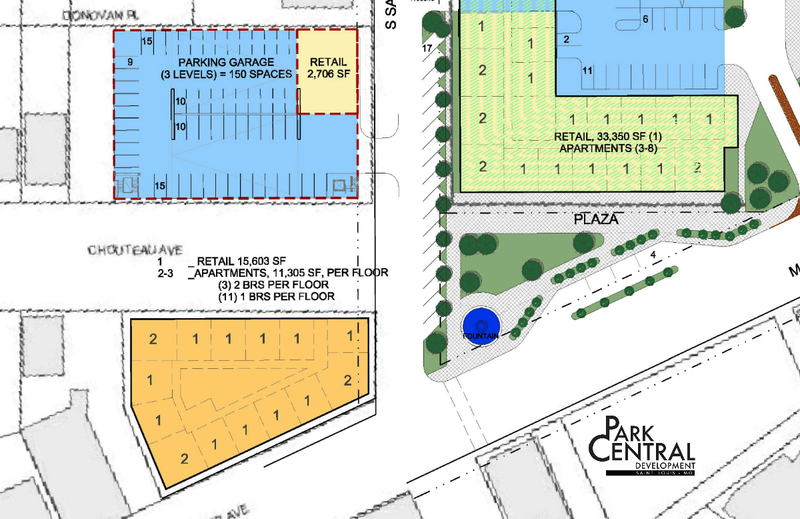 That plan totaled 271 apartment units and 20,000sf of retail space on three lots. 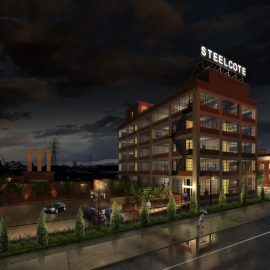 The largest, bounded by Sarah, Chouteau, and Papin Street, is still planned to move forward. 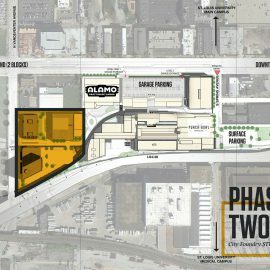 The wedge lot, and the northwest corner of Chouteau and Sarah, a now closed gas station, were dropped from the plan last year. 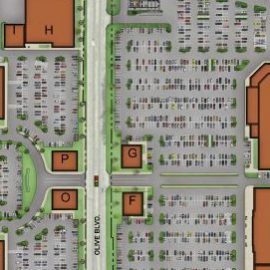 From the 2014 Chouteau’s Grove plan: the current 37-space parking lot (shown in orange) would have been replaced with a three-story mixed use building. 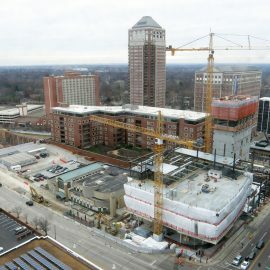 Retail space was planned to occupy 11,305sf on the first level, with six two-bedroom and 22 one-bedroom apartments above. No on-site parking was planned as parking would have been accommodated across Chouteau in a 150-space garage.